Haven’t posted any ship updates in awhile. We had a destroyer go by yesterday on the way to Annapolis. This little ship is passing the house right now. The vessels are fully self-sustained by own equipment for loading/discharging irrespective of port facilities. 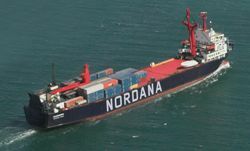 Nordana is Danish, not Swedish… but the IKEAns sometimes reach across the sound for inspiration. I live on a fairly deep bay, so ships are usually 5 nm out… Still, I can identify most of the lines and some of the individual ships. A distraction from work, though. I cannot tell you how envious I am. Glad you like the AIS page. 🙂 I enjoy ship watching from Plum Point but sure do not have the great views you have. The deep water channel is a number of miles out requiring binoculars here.